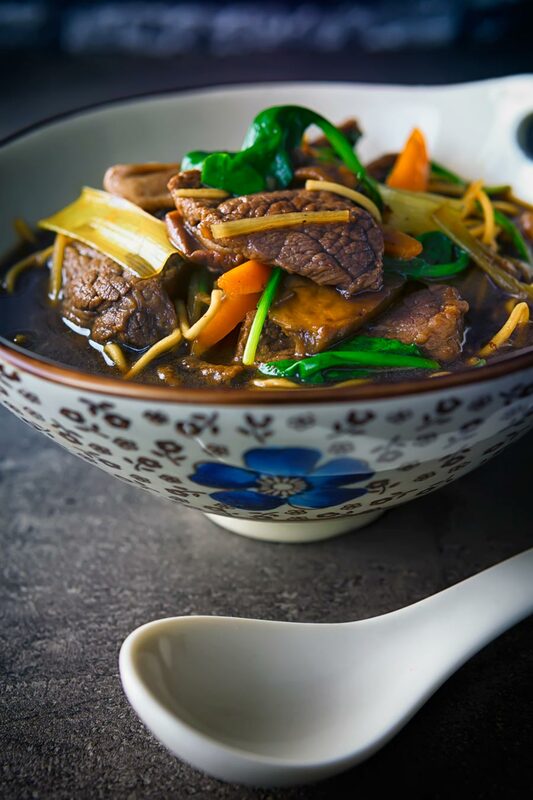 Simple ingredients get an Asian twist in this Chinese and Taiwanese influenced beef noodle soup, super quick to make and full of big flavours! I love a good bowl of soup and this easy beef noodle soup joins a couple of chicken noodle soup recipes here on Krumpli. In the main, the ingredients in this quick soup recipe are store cupboard essentials. Well, they are for me anyway, soy sauces and rice wine are as common a feature in my pantry as salt and pepper. This recipe takes no more than 25 minutes to cook and is super simple yet makes for a filling meal. The beef stays beautifully tender and soft and the dried mushrooms really enrich this glorious soup. As with all stock or broth-based soups by the very best stock you can get or make your own. It is, after all, the core component of this recipe and it will define the flavour of the recipe. Taiwanese Or Chinese Beef Noodle Soup. 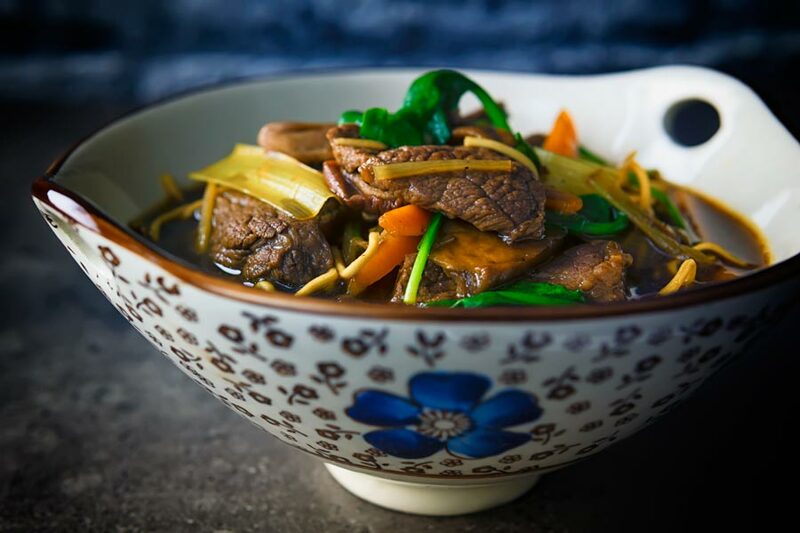 This recipe is very much a stripped back and hurried up Taiwanese beef noodle soup. Ordinarily, a cheaper cut of meat like shank would be slowly braised in water with aromats. This process takes several hours, now I’m definitely not worried about spending time in the kitchen. But this is my quick beef noodle soup recipe, it is about getting big flavours in a bowl and on my table quickly. There is one word of caution here for those of you cooking this recipe. Take note of how salty your beef stock is before getting going! We are adding both light and dark soy sauce here for both flavour and seasoning. 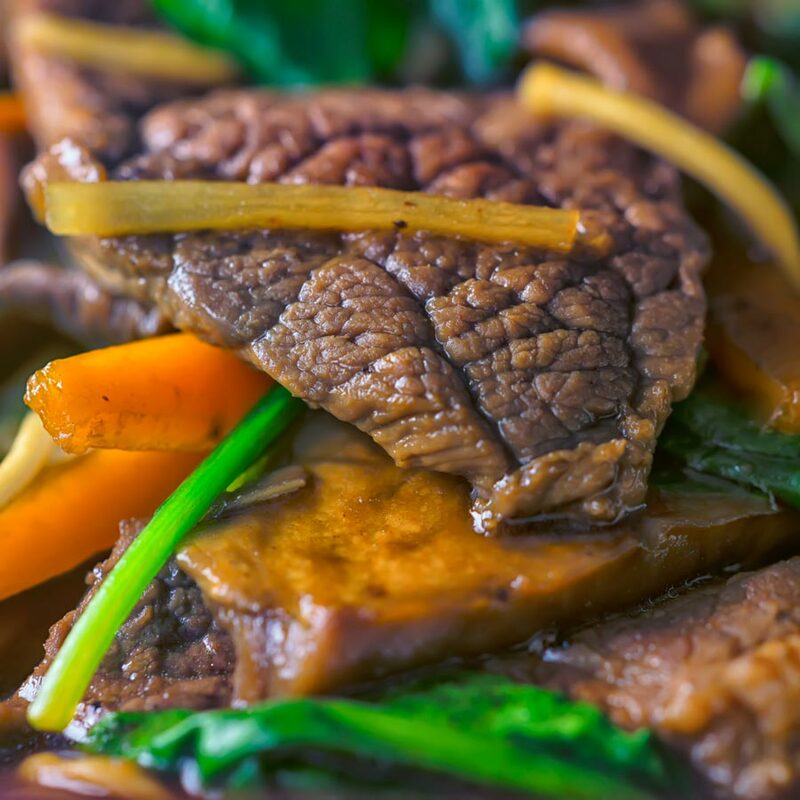 If your beef stock is particularly salty then reduce the amount of light soy sauce. Try not to reduce the dark soy as this adds a sweet richness to the beef broth. How To Use Dried Mushrooms. Dried mushrooms are a fantastic product that will liven up so many recipes. They are simple to use too, all you need to do is steep them in hot water. Essentially it is exactly the same as making a pot of tea! They pack a huge amount of flavour and can be used in a host of recipes. 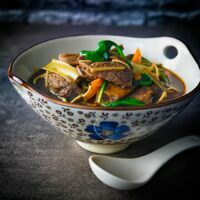 In this beef noodle soup recipe they add a depth of flavour to a beef stock and I use dried shiitake mushrooms. But all mushrooms can be dried and you use them in the same way, steep in water and add to your recipe. They would be a great addition to either my balsamic mushroom risotto or even my cream of mushroom soup! They can initially seem expensive, but you do not need to use many to make a dish. This beef noodle soup uses just 10g and they really add so much to the meal. Begin by soaking the dried mushrooms in 150ml of boiling water for 10 minutes. Whilst these are soaking cut your spring onions and carrots into batons 2-3cm lon and as thin as you can. Finely slice your garlic cloves and slice your ginger into fine batons. Trim your beef of any sinew and slice into medallions around 3-5mm thick. Heat a wok over a fierce heat and then add half of the oil. Season the beef with salt and pepper then stir fry until nicely coloured. Remove and drain the oil from the beef. Return the wok to the heat add the remaining oil and then stir fry the garlic, ginger, carrots, and spring onions for 2 minutes. Add in the rice wine followed by the soy sauces and beef stock, then the dried mushrooms and the steeping liquid. Bring this to the boil and then reduce to simmer for 5 minutes. Return the beef to the simmering liquid and simmer for 60 seconds before adding the noodles. Simmer for 5 minutes before adding in the spinach and stirring to wilt. If you are using fine egg noodles then cook the beef for 3-4 minutes before adding in the egg noodles and cook for 2-3 minutes. What a warm, delicious dinner idea! It’s chilly and rainy outside and this looks like the perfect meal to whip up! 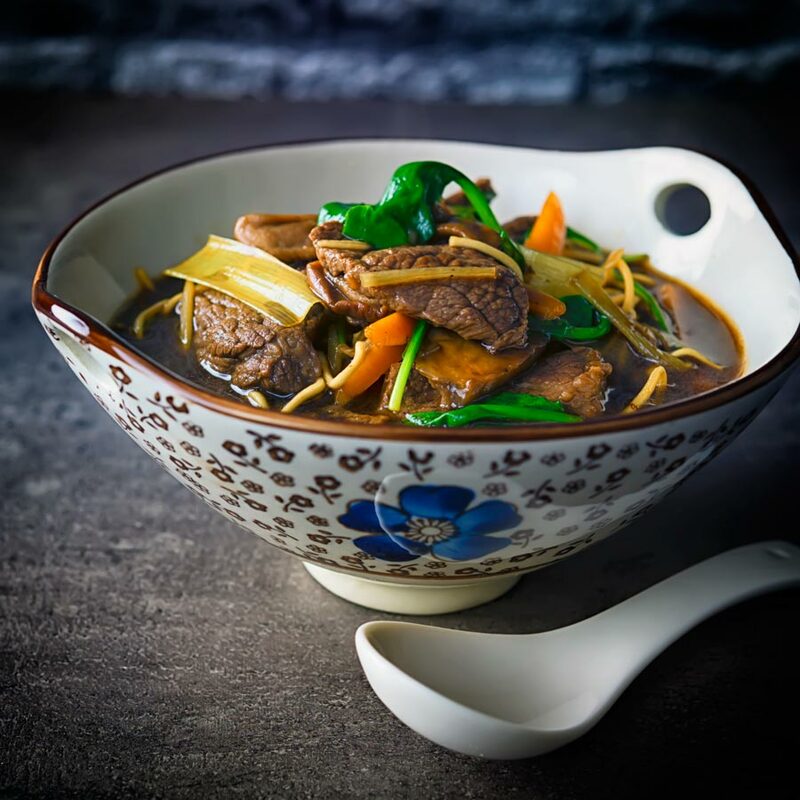 This Taiwanese beef noodle soup might be “stripped back and hurried up” but it looks exquisite – like it had been simmering for hours! Thank you, the dried shrooms help give it that simmmered for hours flaovur too! Noodle soup is such a delicious option for lunch or dinner and this looks incredible! I could do with a bowlful right now! Love the switch of steak to rump so you can ensure it’s tender in this shorter cooking time recipe, it looks so succulent. I love the flavours of East Asia and we ate so well when we visited Taiwan! 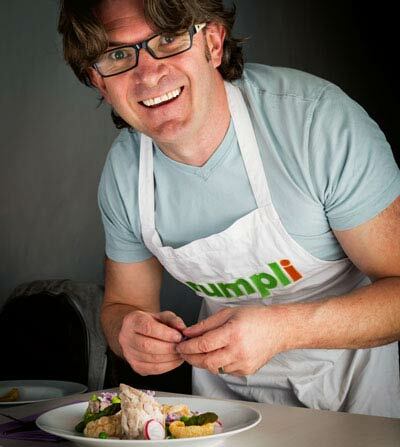 Ilove rump steak, of all the steaks to choose from it is probably my favourite, a great combination of good flavour and good texture when cooked quickly. Brian, I wish I was having this for dinner, it looks so heart warming and delicious! I haven’t used dried mushrooms too often but this has encouraged me to give it a go! I am definitely giving this recipe a go. Thanks Adrienne, they are a fantastic store cupboard ingredient, they last forever and add a depth of flavour to stocks and broths impossible to get any other way.